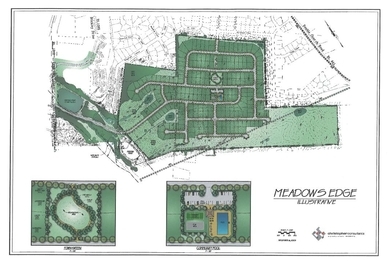 Located in Stephen's City, Virginia, at the edge of Frederick County's urban growth boundary, Meadows Edge is a residential community consisting of 222 single family detached homes, a town green and community pool with tennis courts and play areas. Developing this community gave Equinox a unique opportunity to transition the county's suburban growth into its rural area. With boasting views of the north front of the Massanutten mountain range, Meadows Edge is a special neighborhood that was greeted with praise from both its neighboring community residents and the Frederick County Board of Supervisors and planning officials. © Copyright 2012. Equinox Investments, LLC. All rights reserved.